Cancer survivorship, challenges of treatment, the importance of caregivers and education initiatives were among the topics talked about by visitors to the Canadian Cancer Survivor Network annual Open House in recognition and awareness of World Cancer Day. Over 40 visitors came by the CCSN offices on Courtwood Crescent in Ottawa, ON over the course of the two-hour event on Monday, including patients and survivors of cancer, CCSN staff/volunteers, university students, industry members and more. Among the visitors was Jeremy Roberts, MPP of Ottawa West-Nepean which the riding of the CCSN offices. 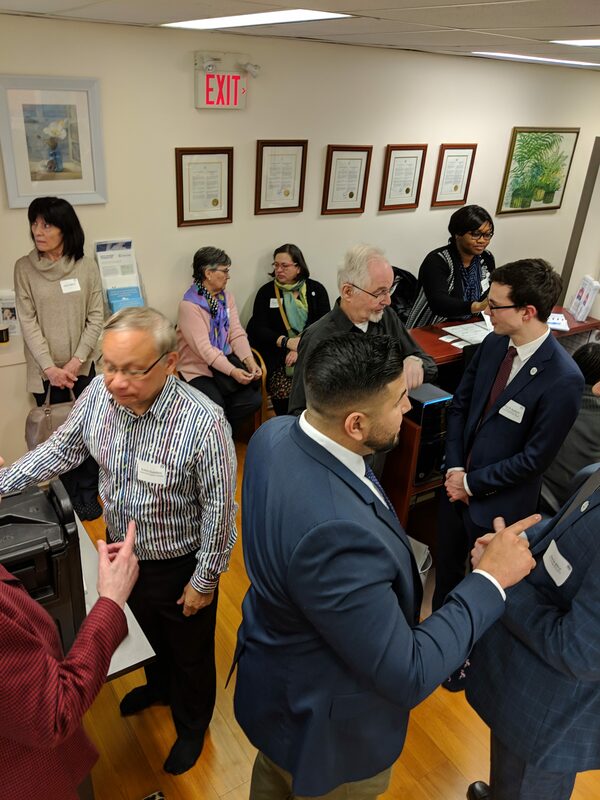 MPP Roberts spoke with patients and volunteers, and took time to address attendees regarding his first members bill – the Caregiver Recognition Act, legislation that will make the awareness and proper treatment of caregivers a priority. CCSN was also pleased to have in attendance a representative of Anita Vandenbeld, MP for Ottawa West-Nepean. A certificate of recognition was presented to Jackie Manthorne, President & CEO of CCSN in honour of the organization’s commitment to cancer patients & survivors. CCSN would also like to thank everyone who took the time to attend the event, as well as the staff at Bridgehead Coffee at Fairlawn Plaza for their generous donation of medium roast coffee for our event. See below for our photo gallery from the event.